The debate on the relationship between democracy and economic development has been a central discussion in the field of political science since at least 1959 when Seymour Martin Lipset’s fundamental paper titled Some Social Requisites of Democracy: Economic Development and Political Legitimacy was published. The protests that have been taking place since September 2014 in Hong Kong have been extensively covered by the Western press but little has been said about Occupy Central movement’s potential to better understand the democratization process. Certainly, the 2014 Hong Kong electoral reform and decisions made by the Standing Committee of the National People’s Congress set the cat among the pigeons. However, adhering to this explanation is unsatisfying for the very reason that it does not explain why less democratic regimes did not experience similar movements and what social requirements were met to spark this democratic outburst at this specific time. ‘Democracy-first’ scholars stipulate that democracy creates the proper conditions for future economic development. Democratic regimes, as opposed to regimes ruled by one, are more likely to have advanced contract systems and property security for instance, which themselves would stimulate long term investments and business transactions (Gerring et al., 2005). ‘Development-first’ proponents take the opposite stance and argue that economic development foster the social changes to welcome democracy. For instance, one of the identified mechanisms is that by educating citizens, even if it is at first only with the intent of stimulating productivity, they will become more likely to think critically about established social rules (Inglehart and Welzel, 2009). Other scholars tried to reconcile the two paradigms. It is the case of Mancur Olson (1993) who concluded that the ‘conditions necessary for a lasting democracy are the same necessary for […] economic growth’. The common limitation pervading these theories, lies in their failure to explain paradoxes. Mongolia–a country afflicted by poverty and that started its democratic transition more than 20 years ago–and oil rich autocracies constitute outliners that are not well explained by the general theories. Even the ‘oil curse’ argument generates more paradoxes by not being applicable to the very democratic Canada and Norway. This limitation comes in great part from the fact that the debate has been fixed and proponents of each theory fight with interposed statistics using different proxies. However, little has been said about populations’ needs and cultural preferences. While economic development has been rather well explained by macroeconomists, democratization has been poorly modeled. Economic development is generally accepted to be fostered when trade is liberalized. The assumption is that by letting people fulfil their own needs that can be answered with wealth, wealth will be created. The difference for democracy is that it is often studied as a normative topic–with scholars arguing how democracy should be–rather than as a purely utilitarian tool to answer needs wealth could not fulfil. Appearing in most business and social psychology laden books, the pyramid-shaped hierarchy of needs designed by Malsow (1943) established a ranking of necessities from the most basic and tangible ones related to survival to more conceptual ones such as self-actualization, with social relations somewhere in between. Although his pyramid has been criticized for being Western culture-centric (Hofstede, 1984), the general idea of establishing a hierarchical order of needs has been rather accepted. Economic development has been studied from bottom-up viewpoint for which it is acknowledged that often economic agents will act in their best interest and thus naturally contribute to the economic development of their country. However, democracy has been regarded has a top-down question for which scholars and political activists thought about how democracy should be based on subjective values. Additionally, its idealization is often fueled by its comparison to less appealing autocratic options. A more down-to-earth way of approaching democracy is to acknowledge its virtues from an individual perspective: democracy is a rational response to the collective need of individuals to develop social interactions–through identification to political ideas or involvement in local politics–and to develop a sense of esteem–through being part of a project bigger than oneself or fighting for an ideal. Citizens demand democracy because they feel that they lack a proper response to these needs, and not merely in admiration for the Athenians. In the case of the pro-democratic movement in Hong Kong, the young have been at the centered of the initiative. 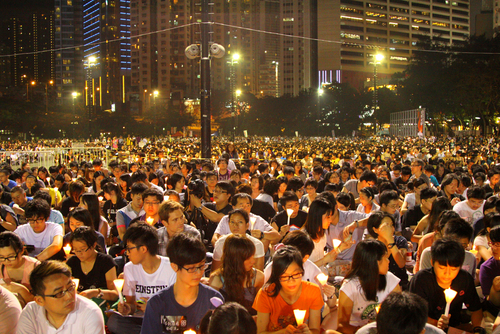 Given the Hong Kongese youth’s position at the bottom of the society, engaging a democratization movement is a rational choice: a transition would have little risk for impairment of their non-existing wealth (expensive real estate and a daunting job market have been blamed too for the sparking the protests) while immediately achieving a higher sense of belonging and esteem. A need-based theory of democratization would also explain outliners more easily: oil-rich autocracies are in a too comfortable position to feel the need to democratize (to some extent, wealth in excess can reply as well to belonging and esteem needs; it is simply not an affordable path for every country). Other differences could be explained by variations in cultures resulting in variations in ranking of needs. Democracy as a response to esteem and belonging needs is not a rival theory to ‘democracy-first’ nor ‘development-first’. To some extent, it could actually support both theories. Rather, it adds a new layer to the democratic transition analysis. The theory is based on an attempt to generalize a theory of psychology to the social level rather than an interpretation of linear regressions; and as we know, major historical shifts are often difficult to predict and by definition not linear. Although it lacks empirical support yet, it can be worthy of consideration since it introduces a novelty: it theorizes democratization based on the subjectivity of needs. It does not romanticize democracy but instead it assumes that it is a rational construction for fulfilling certain needs in the same way that trade through wealth generation is an efficient way to address our physiological needs. Boix, Carles, and Susan C. Stokes. "Endogenous Democratization." World Politics 55.4 (2003): 517-49. Print. Gerring, John, Philip Bond, William T. Barndt, and Carola Moreno. "Democracy and Economic Growth: A Historical Perspective." World Politics 57 (2005): 323-64. Print. Hofstede, Geert. "The Cultural Relativity of the Quality of Life Concept." The Academy of Management Review 9.3 (1984): 389-98. Print. Lipset, Seymour Martin. "Some Social Requisites of Democracy: Economic Development and Political Legitimacy." American Political Science Review 53.1 (1959): 69-105. Print. Maslow, A. H. "A Theory Of Human Motivation." Psychological Review 50 (1943): 370-96. Print. Olson, Mancur. "Dictatorship, Democracy, and Development." The American Political Science Review 87.3 (1993): 567-76. Print. Tuya, Nyamosor. "Democracy and Poverty: A Lesson from Mongolia." Brookings. 1 Apr. 2013. Web. 31 Oct. 2014. <http://www.brookings.edu/research/opinions/2013/04/09-mongolia-tuya>. Does the world need another reserve currency?